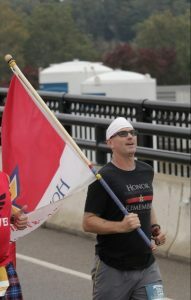 We are assembling a small group (25 maximum) of active or veteran military personnel and dedicated athletes to comprise a core team of runners committed to a 3-day, 146 mile tribute run from the Onondaga County Veteran's Memorial Cemetery in Syracuse to the Gold Star Families Memorial Monument in LaFayette Park in downtown Albany. The run has a specific timetable for each mile marker throughout each day. Runners need to be flexible, willing to run on any given day, and when needed. RAIN OR SHINE. Runners will run approximately 4 miles between hero markers instead of stopping every mile due to safety concerns. 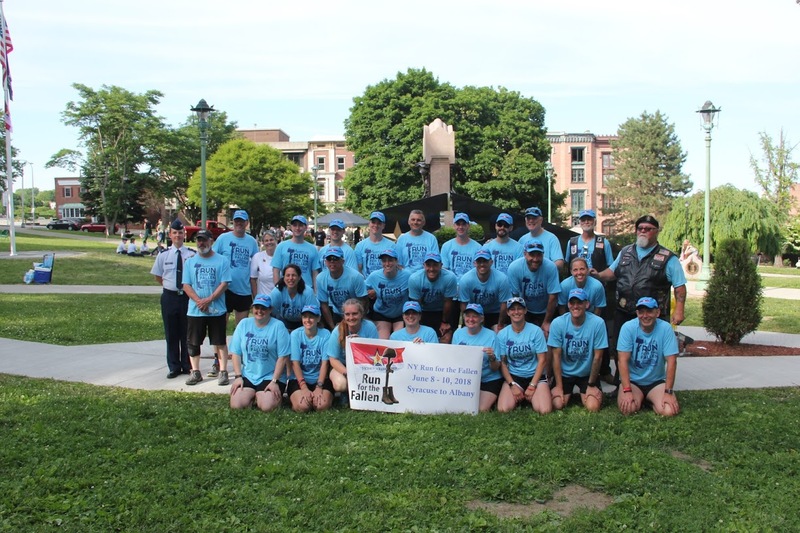 The team will pull completely off the road at the 35 designated Hero Markers along the route, stopping to salute and give tribute by name to each fallen at the designated marker. The team will also greet family, friends, and comrades who may be waiting at the marker. Each runner must be able to maintain an 8.5 to 9.5 minute mile for a minimum of 1 hour or 6 miles or longer. Core teams will rotate at designated exchanges along the route over the 3-day period. We are not looking for quantity of runners, but a solid team dedicated to the remembrance of those who have fallen in service to our country. This route will be grueling at times because of the pace that must be maintained and the many hilly areas along the route. 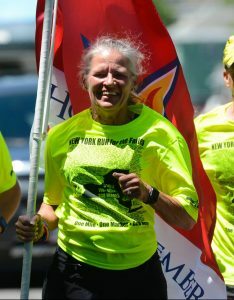 If you are interested in becoming a part of our core team or wish to run any of the 146 mile distance, contact Kristi Mangine at newyork@runforthefallen.org or fill out our Contact Form.  You may also click on the picture of the runner below. As a veteran of the NYARNG and Gold Star sister, I am proud to be joining the NY Run for the Fallen this year. I am proud and honored to be a member of NY Run for the Fallen family. Being a member of Team RWB Lehigh Valley has changed my life in so many positive ways and this run is just another example. Doing this run with my teammates, honoring our Fallen, humbles me to the core. I carry my own personal Hero on all my runs... My Nephew: SSG Brandon R Pepper - US Army (KIA 21 July 2012) Afghanistan, Ghazni Province. I run to honor. I run to remember. I run so they are NEVER forgotten. It is a great honor to be a core runner for the NY Run for the Fallen. 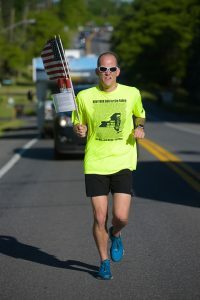 As a 23 year veteran and lifelong runner, I feel extremely fortunate to be able to participate. It will be an incredible experience to honor our Fallen Heroes and to pay tribute to the Gold Star families through this running event! I am excited for the opportunity to be a part of this amazing team and to honor our fallen. 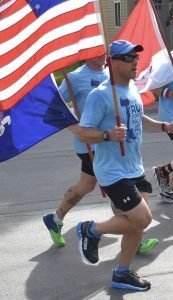 Running has always been a part of my life, not having served in the military myself, I can't think of a better way to honor those who serve and protect our wonderful country. I currently live in Cobleskill with my husband and son. Chuck DeCitise is a Signal Corps Army Veteran from Troy, NY. Served at Ft. Wainwright, AK for the Sight Seeing 6th Infantry Division(L) and at Ft. Stewart, GA for the 3rd Infantry Division(M), Rock of the Marne. 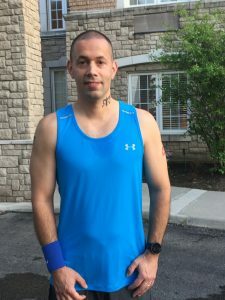 I am an avid runner and strength trainer who is always looking to give back to our Veterans and Heroes that have given so much. New York Run for the Fallen Core Runner and Team Member. My father served 4 years in the Marines and 32 years in the Coast Guard. 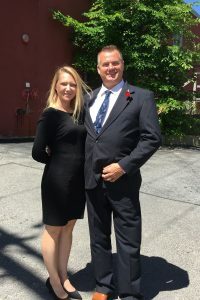 My husband served from 1989-2001 in the Army and re-enlisted in the Army Guard Reserve since 2017. Our son is currently serving in the Air Force. 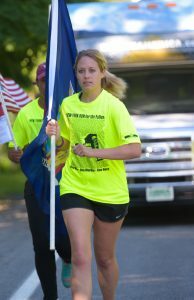 Doing this run is my way of honoring the service of those who have paid the ultimate price, and their family members. 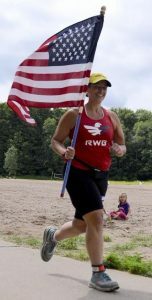 I love running races with my flag for Team RWB, the conversations it starts with people really get them thinking about our service men and women. It is an honor to be a part of the team, running along side some amazing people wanting to Honor our Fallen Heroes. 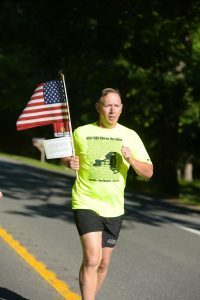 It is an honor to run for my fallen Comrades and connect with their Gold Star Families. 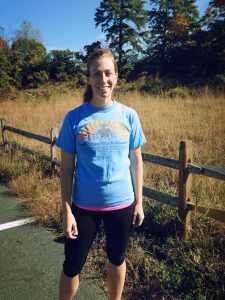 I’m a civilian who’s been running for myself for several years until I heard about NYRFTF. 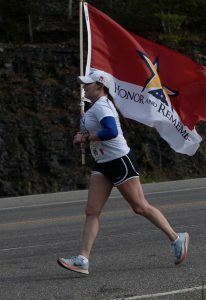 I’m so honored to run for the fallen soldiers who gave so much. This is my second year as a core runner and I am proud to be part of the team. I am honored to be able to participate in such an emotional run. This will be my second year running for NYRFTF. I can not express my gratitude to be allowed to honor the Fallen soldiers and their families who have given of themselves so that I may have my freedoms. As a person who has had family members in the military and many friends who have served and are still serving currently I am forever in their debt. May they Never Be Forgotten. 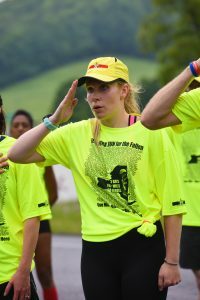 I have been in the Army since 2007 and in the New York Army National Guard since 2010 and a long distance runner for years, this is my second year participating in the NYRFTF. 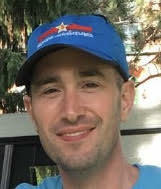 I currently serve full time as a Public Affairs Officer at the New York State Division of Military and Naval Affairs and also a company commander of the Headquarters and Support Company under the famed Rainbow Division. My debt to the heroic men and women who have fallen for this country can never be repaid, for that I will run every mile for them and their families and for their ultimate sacrifice. I love to run. I am not the fastest, but running is my stress relief and it has been the one constant in my life since I started to run in Junior High. I have run different distances from 5k to Half Marathons. However, my favorite running experience has been the Ragnar Relay. It is a fun time running because it is a team event. I have the most fun supporting my teammates and other runners. Running in the NYRFTF will be a memorable running experience. I get to run with other volunteers as a group and run for those who have sacrificed the most. This is more than just another running event, I am running to let the family and friends of The Fallen, know that they are not forgotten. I cannot think of a greater honor. 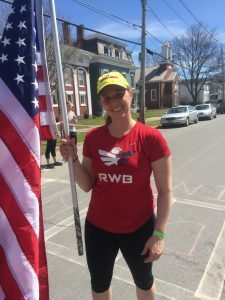 I’m an avid runner, 20+ years under my belt, and a civilian member on Team RWB. I have been an RWB member since 2015, and found out about NYRFTF through a RWB member & close friend. Joined as a core runner in 2017 & am blessed to be a part of such an amazing cause, experience and family. I am a veteran of the Army National Guard and I believe in God and our country. Running is a gift, and if I can use it to honor soldiers that sacrificed it all, then I will gladly run the race that lies before me. Greater love hath no man than this, that a man lay down his life for his friends... I served for over 20 years in the PA National Guard. I am humbled to be able to participate in NYRFTF and honor many of our Fallen Heroes. I carry my personal hero with me on every run I take...My nephew, SGT Timothy VanOrman (KIA 5 February 2008)..who was stationed at Ft Drum, NY. I live with my wife and two children in Saratoga Springs. I joined the Air Force in 2002 and served 6 years. I currently serve full time in the Air National guard, with the 109th Airlift Wing in Scotia, NY. I'm also a proud member of Team RWB, where we bring veterans together with the community through physical and social activities. Running has been my passion for many years and I'm thrilled to be able to use running to pay tribute to our brave Heroes. It's an extraordinary honor to be chosen to participate in the NY Run For The Fallen. I grew up in NY and have made every effort to return to my roots since I joined the Navy almost 10 years ago. 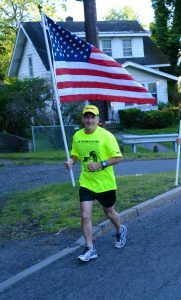 I view The Run for the Fallen as the best possible way of combining my love of running and honoring those that have given their lives in support of our country. This will be my second year in a row where the stars have aligned to allow me to participate and I feel truly blessed to be a part of the process. As a Canadian living in New York State, I feel it is my duty to Honor our service men and women who lost their lives to protect this great nation. I'm a proud member of Team RWB Buffalo and wear the Eagle with pride. As an Eagle, running along side fellow Eagles is truly epic. 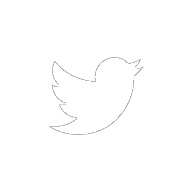 I hope to reach our goal with your help. Team RWB is more than a Veteran's organization, it's a family. Please help us to reach our goal, supporting the families who have lost a loved one. I’m honored to be joining the NYRFTF team for the first time. I love our country and all those who have fought, served, and fallen to defend it. This run is an opportunity for me to give thanks to those who protect us everyday and those who have given the ultimate sacrifice for our freedom. I am an active duty Naval Officer with almost 24 years of service. Prior Army and now Navy, most of my time was served enlisted. I spent a large majority of this time with Naval Special Warfare where my family and I had the opportunity to serve alongside very special heroes. 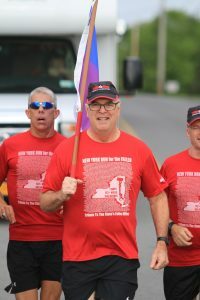 We have participated in numerous hero events over the years, and I am grateful to run with the NYRFTF team to honor so many more of our special heroes! As a runner for most of my life I am very appreciative for the opportunity to combine running and remembering our fallen. NYRFTF is an amazing way to pay tribute to our Service members and their families. Though not a Veteran myself, as life goes on, I appreciate more and more the sacrifices that have been made by our brave men and women in our armed forces. miles I have ever, or will ever run.